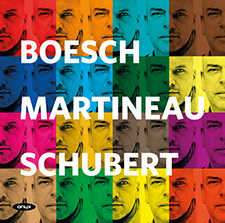 Florian Boesch and Malcolm Martineau have recorded the three great Schubert song cycles for ONYX, and have earned a formidable reputation as a partnership that delivers, in recital and in the studio, some of the most thought-provoking and challenging interpretations of Schubert Lieder of our time. ‘Inspired and quite unforgettable’, said Gramophone of their Winterreise, while The Sunday Times commented, ‘Never, in my experience, has Winterreise sounded bleaker than in this magnificently sombre and vivid account’, and The Guardian called it ‘unquestionably superb’. The BBC Music Magazine described Die schöne Müllerin as ‘one of the most challenging and provocative new recordings of this cycle – and one of the best performed and recorded’.